"FANDOM" redirects here. For the term denoting a subculture for fans, see Fandom. Fandom,[a] known as Wikia before October 2016 and Wikicities before 2006, is a wiki hosting service and domain operated by Wikia, Inc., a for-profit Delaware company founded in October 2004 by Jimmy Wales and Angela Beesley and headed by Perkins Miller as CEO. Fandom uses the open-source wiki software MediaWiki, the same used by the Wikimedia Foundation. Wikia, Inc. derives its income from advertising and sold content, publishing most user-provided text under copyleft licenses. The company also runs the associated Fandom editorial project, offering pop-culture and gaming news. Wikia was launched on October 18, 2004 under the name "Wikicities" (which invited comparisons to GeoCities), by Jimmy Wales and Angela Beesley Starling—respectively Chairman Emeritus and Advisory Board member of the Wikimedia Foundation. The name of the project was changed to "Wikia" on March 27, 2006. In the month before the move, Wikia announced a US$4 million venture capital investment from Bessemer Venture Partners and First Round Capital. Nine months later, Amazon.com invested US$10 million in Series B funding. By September 2006, it had approximately 1,500 wikis in 48 languages. Over time, Wikia has incorporated formerly independent wikis that joined Wikia, such as LyricWiki, Nukapedia, Uncyclopedia, and WoWWiki. Gil Penchina described Wikia early on as "the rest of the library and magazine rack" to Wikipedia's encyclopedia. The material has also been described as informal, and often bordering on entertainment, allowing the importing of maps, YouTube videos, and other non-traditional wiki material. By 2010, wikis could be created in 188 different languages. In October 2011, Wikia announced that Craig Palmer, the former CEO of Gracenote, would replace Penchina as CEO. On February 8, 2012, co-founder Beesley Starling announced she was leaving Wikia to launch a startup called ChalkDrop.com. At the end of November 2012, it was announced that Wikia had raised another US$10.8 million in Series C funding from Institutional Venture Partners and previous investors Bessemer Ventures Partners and Amazon.com. Another $15 million was raised in August 2014 for Series D funding, with investors Digital Garage, Amazon, Bessemer Venture Partners, and Institutional Venture Partners. The total raised at this point was $39.8 million. On March 4, 2015, Wikia announced its appointment of Walker Jacobs, who was the former Executive Vice-President of Turner Broadcasting System, to the new position of Chief Operating Officer. In December 2015, Wikia launched the Fan Contributor Program. On January 25, 2016, Wikia launched a new entertainment news site named Fandom. On September 26, 2016, Wikia announced that Wikia.com would be renamed "Fandom powered by Wikia" on October 4, 2016, to better associate themselves with the Fandom website. Wikia, Inc. would remain under its current name. At the time, the homepage of Wikia.com was moved to wikia.com/fandom. On December 4, 2016, Wikia announced the hiring of Dorth Raphaely to be their Chief Content Officer. Previously Dorth Raphaely had worked at Bleacher Report as their General Manager. In Spring of 2018, following an investment by private equity firm TPG Capital, Craig Palmer was replaced by Andrew Doyle who assumed the role of Interim CEO. On July 2, 2018, it was announced that Fandom had purchased Screen Junkies from Defy Media. On August 15, 2018, it was announced that Wikia will fully change its domain name into fandom.com in early 2019. Various Wikis were tested with the new domain during 2018, with Wikia confirming that the process would be completed by February 4, 2019 with the exception of Wikis that focused on more serious topics, which would instead have their domains changed to wikia.org instead of fandom.com. The process was delayed by a few weeks due to issues with Google adverts, but was properly completed on February 22, 2019. The wikia.org addresses were migrated on April 11, 2019. On December 12, 2018, Wikia announced that they had acquired Curse Media, including wiki services Gamepedia, D&D Beyond, Futhead, and Muthead. The Uncyclopedia hosted on Wikia has been scheduled for deletion due to concerns by Wikia staff of offensive content. Wikia communities consist of online encyclopedias, each one specializing in a particular subject. Although Wikia allows almost anything to be the main focus of a wiki, the most common interest of its users is in popular fiction franchises of films, games, books, and other media, due to the considerable limitation of such detailed information by Wikipedia's notability policies. This contributed to the service being renamed to Fandom. The main purpose of articles in a Wikia community is to cover information and discussion on a particular topic in a much greater and more comprehensive detail level than what can be found on Wikipedia articles. For example, Spiteful Crow, an enemy character in EarthBound, may have its own article on the EarthBound wikia, whereas the character may not be considered notable enough for a Wikipedia page. Also, the writing style is mostly directed to those familiar with specific vocabulary and terminology rather than to the lay and general public of Wikipedia; the Harry Potter wiki, for example, is written from the perspective of everything in the franchise universe being real, thus the article about the character Ronald Weasley starts describing the subject as "a pure-blood wizard, the sixth and youngest son of Arthur and Molly Weasley" instead of "a character in the Harry Potter series". Other examples of content that is generally considered beyond the scope of information of Wikipedia articles includes Wikia information about video games and related video game topics, detailed instructions, gameplay details, plot details, and so forth. Gameplay concepts can also have their own articles. Wikia also allows wikis to have a point of view, rather than the neutral POV that is required by Wikipedia (although NPOV is a local policy on many Wikia communities). Wikis are not owned by their founders, nor does the founder's opinion carry more weight in disagreements than any other user's opinion. Consensus and cooperation should be the primary means for organizing a community. However, Wikia may take decisions affecting the community even if there's no consensus at all. The Wikia file store as of June 2011[update] includes over 8 million files stored on SSD. As of August 2015,[update] Wikia uses a heavily modified version of MediaWiki software, based on the version 1.19 of MediaWiki, which was officially marked as obsolete in May 2015. It has more than 250 extensions installed, most of them created by their staff of developers, to add social features like blogs, chat, badges, forums, and multimedia, but also remove features like advanced user options or skins. The personal choice of using the Monobook skin instead of their default custom skin was removed on May 25, 2018, alluding GDPR compliance. In August 2016, Wikia announced it would switch to a Service Oriented Architecture. It has also removed many custom extensions and functionality for specific wiki, has created certain features to fill those needs. Until July 2018, most of Wikia was only available over HTTP, although an upgrade to HTTPS with TLS encryption was planned and under development. Personal data, such as registration and login information, is already served over HTTPS. On July 12, 2018, Wikia switched over to HTTPS. In 2016, Wikia launched Fandom, an online entertainment media web site. The program utilizes volunteer contributors called "Fandom Contributors" to produce articles, working alongside an editorial team employed by Wikia. In contrast to the blogging feature of individual wiki communities, Fandom focuses on pop culture and fan topics such as video games, movies, and television shows. The project features fan opinion, interviews with property creators, reviews, and how-to guides. Fandom also includes videos and specific news coverage sponsored or paid for by a property creator to promote their property. In the same year, it was also announced that the entire Wikia platform would be rebranded under the Fandom name on October 4, 2016. A leak from Fandom's Community Council was posted to Reddit's /r/Wikia subreddit on August 12, 2018, confirming that Fandom would be migrating all wikis from the wikia.com domain, to fandom.com in early 2019, as part of a push for greater adoption of Fandom's wiki-specific applications on both iOS and Android's app ecosystems. The post was later deleted. Wikia has created several official partnerships to create wikis, vetted by the corporation as being the "official" encyclopedia or wiki of a property. In 2014, Wikia partnered with Roddenberry Enterprises to create the Trek Initiative, a Wikia hosted wiki community site that features video interviews, promotions, and other material about Star Trek to celebrate its 50th anniversary. In 2013, Wikia partnered with SOE (now called Daybreak Games) to create official wikis for several of their games such as Free Realms, Planetside 2, and the Everquest franchise. Wikia made similar partnerships with 2K Games during the launch of Civilization: Beyond Earth and Warner Bros Interactive for Shadow of Mordor. Wikia also has partnerships with Lionsgate Media to promote Starz and Film franchises through wiki content, fandom articles, and advertisements. In January 2009, the company created a question and answer website named "Wikianswers". In March 2010, Wikia re-launched "Answers from Wikia", where users could create topic-specialized knowledge market wikis based upon Wikia's own Wikianswers subdomain. OpenServing was a short-lived Web publishing project owned by Wikia, founded on December 12, 2006, and abandoned, unannounced, in January 2008. Like Wikia, OpenServing was to offer free wiki hosting, but it would differ in that each wiki's founder would retain any revenue gained from advertising on the site. OpenServing used a modified version of the Wikimedia Foundation's MediaWiki software created by ArmchairGM, but was intended to branch out to other open source packages. According to Wikia co-founder and chairman Jimmy Wales, the OpenServing site received several thousand applications in January 2007. However, after a year, no sites had been launched under the OpenServing banner. ArmchairGM was a sports forum and wiki site created by Aaron Wright, Dan Lewis, Robert Lefkowitz and developer David Pean. Launched in early 2006, the site was initially US-based, but sought to improve its links to sports associated with Britain over its first year. Its MediaWiki-based software included a Digg-style article-voting mechanism, blog-like comment forms with "thumbs up/down" user feedback, and the ability to write multiple types of posts (news, opinions, or "locker room" discussion entries). In late 2006, the site was bought by Wikia for $2 million. After the purchase was made, the former owners applied ArmchairGM's architecture to other Wikia sites. From September 2010 to February 2011, Wikia absorbed the site's encyclopedia articles and blanked all of its old blog entries, effectively discontinuing ArmchairGM in its original form. Wikia, Inc. initially proposed creating a copyleft search engine; the software (but not the site) was named "Wikiasari" by a November 2004 naming contest. [c] The proposal became inactive in 2005. The "public alpha" of Wikia Search web search engine was launched on January 7, 2008, from the USSHC underground data center. This roll-out version of the search interface was roundly panned by reviewers in technology media. The project was ended in March 2009. Late in 2009, a new search engine was established to index and display results from all sites hosted on Wikia. Wikia communities have complained of inappropriate advertisements, or advertising in the body text area. There is no easy way for individual communities to switch to conventional paid hosting, as Wikia usually owns the relevant domain names. If a community leaves Wikia for new hosting, the company typically continues to operate the abandoned wiki using its original name and content, adversely affecting the new wiki's search rankings, for advertising revenue. Wikia has sometimes expanded by acquiring an existing wiki's domain name, user lists, and databases, from a founder or co-founder in return for money and stock options. The original wiki is then shut down without consulting its editors or wider community, and the domain redirected to Wikia's version of the project. In the case of the acquisitions of uncyclopedia.org from Jonathan Huang in July 2006, gamewikis.org from Phil Nelson in October 2007, and memory-alpha.org from Harry Doddema and Dan Carlson in January 2008, the content was under a non-commercial license. In June 2008, Wikia adopted a new skin, Monaco, intending to implement it as the default on almost all hosted wikis. Many wiki users felt the choice of skin default should remain their own. The switch went ahead, but some wikis retained Monobook as their default. In September 2008, the Transformers Wiki moved content to their own server, citing the format-altering ads and mandatory changes as reasons for their departure. WikiFur moved likewise in August 2009; the Grand Theft Auto wiki moved in October 2010, the Nethack wiki in November 2010, and the Doom wiki in September 2011. In May 2009, Wikia removed the ability of individual users to choose a skin other than Monaco or Monobook, claiming a testing burden and relative lack of features. Soon after, Wikia removed the option to set the default skin to Monobook, with the exception of certain large wikis, namely, Uncyclopedia. On May 25, 2018, Monobook was removed entirely from Wikia, and all wikis and users using Monobook were forced to switch to Wikia's default Oasis skin, causing disgruntlement from many users in the community. The company cited technical difficulties related to keeping both skins in compliance with the European Union's General Data Protection Regulation. Wikia has been accused of unduly profiting from a perceived association with Wikipedia. Although Wikia has been referred to in the media as "the commercial counterpart to the non-profit Wikipedia", Wikimedia and Wikia staff call this description inaccurate. We obtained about a dozen bids...We used averaging as a way to arrive at a fair market rate to neither advantage nor disadvantage Wikia when suggesting a rate. The averaging also resulted in a rate that was roughly equivalent to the most comparable space in the running. 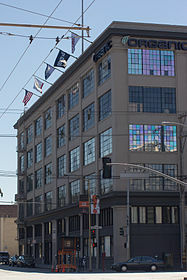 Wikia, Inc. is headquartered in San Francisco, California. The company was incorporated in Florida in December 2004 and re-incorporated in Delaware as Wikia, Inc. on January 10, 2006. Wikia has technical staff in the US, but also has an office in Poznań, Poland, where the primary engineering functions are performed. Wikia derives income from advertising. The company initially used Google AdSense, but moved on to Federated Media before bringing ad management in-house. Alongside Wikia's in-house advertising, they continue to use Adsense as well as Amazon Ads and several other third party advertising services. Wikia additionally gains income from various partnerships oriented around various sweepstake sponsorships on related wikis. Wikia has several other offices. International operations are based in Germany, and Asian operations and sales are conducted in Tokyo. Other sales offices are located in Chicago, Latin America, Los Angeles (marketing programming and content), New York, and London. ^ Most content on Wikia was licensed under the GNU Free Documentation License until June 19, 2009, at which point most wikis were relicensed to CC BY-SA. ^ The name was derived from the Hawaiian word for "quick" and asari, Japanese for "rummaging search". ^ "Media kit". Wikia. Archived from the original on November 2, 2015. Retrieved November 1, 2015. ^ "Wikia Fan Studio FAQ". Archived from the original on October 20, 2016. Retrieved September 21, 2016. ^ "Wikia API Wiki". api.wikia.com. Archived from the original on May 14, 2016. Retrieved November 26, 2018. ^ "Fandom powered by Wikia". Archived from the original on February 8, 2014. Retrieved November 26, 2018. ^ "Wikia.com Site Info". Alexa Internet. Archived from the original on September 6, 2018. Retrieved December 9, 2018. ^ "Statistics". Community Central. Archived from the original on July 2, 2017. Retrieved May 14, 2018. ^ "Licensing". Fandom. Wikia, Inc. Archived from the original on May 14, 2018. Retrieved May 14, 2018. ^ a b c Palmer, Craig L. (September 26, 2016). "Wikia is now Fandom powered by Wikia". Community Central. Wikia, Inc. Archived from the original on June 17, 2018. Retrieved October 5, 2016. ^ Pink, Daniel H. (March 13, 2005). "The Book Stops Here". Wired (13.03). Archived from the original on March 4, 2005. Retrieved August 1, 2007. ^ a b "About Fandom". Fandom powered by Wikia. Wikia, Inc. Archived from the original on May 23, 2018. Retrieved May 3, 2018. ^ a b John K Waters & John Lester (2010). The Everything Guide to Social Media: All you need to know about participating in today's most popular online communities. Adams Media. p. 171. ISBN 9781440509469. Retrieved September 17, 2014. ^ "Fandom". Fandom powered by Wikia. Wikia, Inc. Archived from the original on May 21, 2018. Retrieved May 3, 2018. ^ Gussow, Dave (April 4, 2005). "Global villages convene in wiki town halls". St. Petersburg Times. Archived from the original on April 24, 2005. Retrieved April 7, 2005. ^ Pete Cashmore (March 28, 2006). Mashable, ed. "Wikia - Build Your Own Wiki". Archived from the original on September 5, 2015. Retrieved May 13, 2015. ^ Hinman, Michael (March 10, 2006). "Venture capitalists invest wiki-millions". Tampa Bay Business Journal. Archived from the original on March 12, 2007. Retrieved March 10, 2006. ^ "Jimmy Wales's Wikia Venture Gets Funding From Amazon". The Wall Street Journal. December 6, 2006. Archived from the original on December 25, 2016. Retrieved December 24, 2016. ^ a b Shannon, Victoria (September 28, 2006). "Wikipedia Founder Staffs For Profit Wikia Spinoff". International Herald Tribune. Archived from the original on October 21, 2006. Retrieved October 28, 2006. ^ Warschauer, Mark; Grimes, Douglas (2007). "Audience, Authorship, and Artifact: The emergent semiotics of Web 2.0". Annual Review of Applied Linguistics. 27: 1–23. CiteSeerX 10.1.1.540.2850. doi:10.1017/S0267190508070013. ^ Matthew Barton & Robert Cummings (2009). Wiki Writing: Collaborative Learning in the College Classroom. University of Michigan Press. p. 14. ISBN 978-0472024513. Retrieved September 17, 2014. ^ Lon Safko (2010). The Social Media Bible: Tactics, Tools, and Strategies for Business Success. John Wiley & Sons. p. 491. ISBN 9780470912706. Retrieved September 18, 2014. ^ Marlowe, C. (October 13, 2011). "Wikia names ex-Gracenote Craig Palmer as CEO". DMWMedia.com. Archived from the original on October 16, 2011. Retrieved October 16, 2011. ^ Beesley, Angela (February 8, 2012). "Leaving Wikia". Community Central. Wikia, Inc. Archived from the original on May 23, 2018. Retrieved May 22, 2018. ^ Tsotsis, Alexia (November 30, 2012). "With 1B Pageviews Under Its Belt, UGC Giant Wikia Raises $10.8M From IVP, Bessemer & Amazon". TechCrunch. Archived from the original on July 5, 2017. Retrieved December 10, 2012. ^ Dan Primack (August 28, 2014). "Term Sheet -- Thursday, August 28". Fortune Magazine. Archived from the original on September 5, 2014. Retrieved September 18, 2014. ^ Ingrid Lunden (August 27, 2014). "User-Generated Content Portal Wikia Raises Another $15M To Crack Into Asia". TechCrunch. Archived from the original on July 7, 2017. Retrieved September 18, 2014. ^ PRNewswire (March 4, 2015). "Wikia Appoints Walker Jacobs Chief Operating Officer". PR Newswire. PR Newswire Association LLC. Archived from the original on September 24, 2015. Retrieved August 17, 2015. ^ Chmielewski, Dawn (January 25, 2016). "Wikia Launches Fandom, a New Place to Get Your Nerd On". Recode. Archived from the original on June 21, 2016. Retrieved June 15, 2016. ^ Wikia, Fandom powered by. "Wikia, Inc. Announces New Senior Vice President of Content at Fandom, Dorth Raphaely". PR Newswire. Cision. Archived from the original on April 30, 2018. Retrieved April 30, 2018. ^ "Wikia, Inc.'s FANDOM Announces Investment Led by Media Veteran Jon Miller". www.prnewswire.com. Archived from the original on May 4, 2018. Retrieved May 2, 2018. ^ "Fandom Acquires Screen Junkies From Defy Media". Variety. July 2, 2018. Archived from the original on July 2, 2018. Retrieved July 5, 2018. ^ Rhea, Brandon (August 15, 2018). "Wiki domains will be changing from wikia.com to fandom.com in early 2019". Community Central. Wikia, Inc. Archived from the original on August 16, 2018. Retrieved August 16, 2018. ^ "Fandom and Curse Media are joining forces". Community Central. Wikia, Inc. December 12, 2018. Retrieved December 12, 2018. ^ "A message from Fandom". Uncyclopedia (Wikia). Archived from the original on February 27, 2019. Retrieved February 27, 2019. ... So we are looking again at Uncyc’s content, and have decided that it’s not the sort of thing that we want to host anymore. ^ McNichol, Tom (March 2007). "With Wikia, a Wikipedia founder looks to strike it rich". Business 2.0 Magazine. Archived from the original on July 25, 2008. Retrieved June 24, 2008. ^ "Spiteful Crow". EarthBound Wiki. Archived from the original on November 20, 2016. Retrieved November 19, 2016. ^ Ronald Weasley on harrypotter.fandom.com. Webarchive. Archived on 28 February 2019. ^ Caroline Coubieres; Sabine Roux (2015). Wikia: Between Document Simulacra and Documented Fictions. Proceedings from 12th Annual Meeting of the Document Academy. 2. Archived from the original on December 25, 2016. Retrieved December 24, 2016. ^ Camille Roth (October 21, 2007). Viable Wikis: Struggle for Life in the Wikisphere (PDF). WikiSym '07. Archived (PDF) from the original on December 25, 2016. Retrieved December 24, 2016. ^ "Licensing". Fandom. Wikia, Inc. Archived from the original on May 21, 2018. Retrieved May 21, 2018. ^ Beesley Starling, Angela. "Licensing update June 19, 2009". Fandom Community Central. Archived from the original on July 15, 2018. Retrieved May 21, 2018. ^ a b "Community Creation Policy". Fandom. Wikia, Inc. Archived from the original on May 21, 2018. Retrieved May 7, 2017. ^ "Fandom network operations - a new concept to understand relations between wikia staff and communities". Fandom Community Central. Archived from the original on October 11, 2017. Retrieved May 7, 2017. ^ Garczewski, Lucas (June 12, 2012). "MediaWiki Upgrade". Community Central Wikia. Wikia, Inc. Archived from the original on June 13, 2018. Retrieved August 4, 2015. ^ a b "Version information". Community Central Wikia. Archived from the original on November 8, 2017. Retrieved May 22, 2018. ^ "End of life announcement - 1.19.x LTS". mediawiki-announce mailing list archive. Archived from the original on January 30, 2016. Retrieved August 4, 2015. ^ "Tour of Wikia Features". Community Central. Archived from the original on June 13, 2018. Retrieved August 4, 2015. ^ "What happened to thumbnail image size in my preferences?". Community Central Wikia. Archived from the original on January 31, 2016. Retrieved August 4, 2015. ^ "UserPreferencesV2 extension code". GitHub code repository. Archived from the original on January 30, 2016. Retrieved August 4, 2015. ^ "Wikia's new look - FAQ". Community Central Wikia. Wikia, Inc. September 15, 2010. Archived from the original on June 13, 2018. Retrieved August 4, 2015. ^ a b Quievryn, Tim (May 21, 2018). "The Future of Monobook on FANDOM". Community Central. Wikia, Inc. Archived from the original on May 22, 2018. Retrieved May 21, 2018. ^ Quievryn, Tim (August 29, 2016). "Introducing Service-Oriented Architecture, A New Approach to Software Development". Community Central. Wikia, Inc. Archived from the original on June 6, 2018. Retrieved April 6, 2017. ^ Quievryn, Tim (January 13, 2016). "Introducing New Moderator Opportunities For Community Administration". Community Central. Wikia, Inc. Archived from the original on October 8, 2018. Retrieved April 6, 2017. ^ Quievryn, Tim (October 26, 2017). "FANDOM Increasing HTTPS Support To Improve Security". Community Central. Wikia, Inc. Archived from the original on April 26, 2018. Retrieved April 26, 2018. ^ "HTTPS Next Steps: URL Changes for International Wikis". Community Central. Archived from the original on October 19, 2018. Retrieved October 18, 2018. ^ "Fan Contributor". Fandom. Wikia, Inc. Archived from the original on November 8, 2017. Retrieved May 21, 2018. ^ "Wikia will be changing ALL wiki URL to .fandom.com at the start of 2019". Reddit. Archived from the original on August 13, 2018. Retrieved August 13, 2018. ^ "Mashable". Archived from the original on October 5, 2016. ^ "MMORPG". Archived from the original on October 5, 2016. ^ "PR Newswire". Archived from the original on October 5, 2016. ^ "Wikia Shadow of Mordor". Shadow of Mordor Wikia. Archived from the original on October 5, 2016. ^ Schonfeld, Erick (January 31, 2009). "Jimmy Wales Quietly Launches Wikianswers". Techcrunch.com. Archived from the original on March 4, 2009. Retrieved July 17, 2009. ^ "Free wiki hosting company Wikia to let you create your own question and answer sites". Digital.venturebeat.com. Archived from the original on March 30, 2010. Retrieved December 3, 2011. ^ a b c "Wikipedia founder remakes Web-publishing economics". Reuters/USA Today. December 12, 2006. Archived from the original on February 15, 2008. Retrieved October 4, 2007. ^ "Wikia Announces Free Wiki Hosting". TechCrunch. December 11, 2006. Archived from the original on May 15, 2008. Retrieved May 12, 2008. ^ a b "Wikia's OpenServing Project Dies a Quiet Death". Mars Magazine. October 10, 2007. Archived from the original on January 13, 2008. Retrieved May 12, 2008. ^ "Wikipedia to share collaborative software". Daily Times. December 18, 2006. Archived from the original on May 28, 2014. Retrieved May 28, 2014. ^ "Wikia Unveils OpenServing - the Mother of All Freebies". Business Wire. December 11, 2006. ^ "Wikipedia founder to share collaborative software". AFP. December 2006. Archived from the original on 2007-12-31. ^ "Wikis can succeed on newspaper sites, claims Wikipedia founder". Online Journalism News, Journalism.co.uk. January 19, 2007. Archived from the original on December 31, 2007. Retrieved October 4, 2007. ^ Blitstein, Ryan (December 6, 2006). "Amazon puts faith – and money – in Wikia". MercuryNews.com. Archived from the original on January 5, 2007. Retrieved February 18, 2007. ^ Rich Miller (2008-01-07). "Wikia Search Launches From Iowa Data Bunker". Data Center Knowledge. Archived from the original on May 11, 2010. Retrieved April 26, 2010. ^ Manjoo, Farhad (January 7, 2008). "Wikipedia founder's search engine gets bad reviews". Salon.com. Archived from the original on June 5, 2012. Retrieved January 7, 2008. ^ Needleman, Rafe (March 31, 2009). "Wales giving up on Wikia Search". Webware. CNet. Archived from the original on April 3, 2009. Retrieved July 17, 2009. ^ Finkelstein, Seth (September 25, 2008). "Read me first: Wikipedia isn't about human potential, whatever Wales says". The Guardian. London. Archived from the original on September 27, 2008. Retrieved December 18, 2016. ^ Finkelstein, Seth (July 31, 2008). "How will Wikia cope when the workers all quit the plantation?". The Guardian. London. Archived from the original on December 1, 2016. Retrieved December 18, 2016. ^ "GuildWiki:Wikia Move". GuildWiki. Archived from the original on December 5, 2010. Retrieved October 20, 2007. ^ "Announcement: Wikia & Uncyclopedia". Uncyclopedia. July 10, 2006. Archived from the original on May 21, 2009. Retrieved March 12, 2009. ^ "Wikia now owns memory-alpha.org". Memory Alpha. February 8, 2015. Archived from the original on February 8, 2015. Retrieved February 8, 2015. ^ Wikia, Inc. (June 17, 2008). "Wikia's New Style". Community Central. Wikia, Inc. Archived from the original on April 30, 2013. Retrieved June 20, 2009. ^ "Press Release: Teletraan-1 Wikia moves to TFWiki.net - Transformers Wiki". Archived from the original on November 30, 2010. Retrieved October 15, 2010. ^ Laurence Parry (August 17, 2009). "English WikiFur moved to en.wikifur.com". WikiFur News. Archived from the original on December 6, 2014. Retrieved May 11, 2011. ^ "Grand Theft Wiki:Move from Wikia". Grand Theft Wiki. October 8, 2010. Retrieved March 3, 2019. ^ "Template:News". Nethack Wiki. January 16, 2013. Retrieved February 26, 2013. ^ "Doom Wiki:Departure from Wikia". January 20, 2012. Archived from the original on August 31, 2017. Retrieved February 26, 2013. ^ "Forum:Changes to skin preferences". Community Central. Wikia, Inc. May 19, 2009. Archived from the original on September 28, 2018. Retrieved February 9, 2010. ^ "Wikipedia: Special Treatment for Wikia and some other Wikis" Archived August 3, 2017, at the Wayback Machine. TechCrunch. April 28, 2007. ^ "Living in the Digital Age - Shift - DW (Arabia) - 25.09.12 - DW.DE". DW.DE. Archived from the original on August 8, 2014. Retrieved December 4, 2012. ^ "Wikipedia founder says to challenge Google, Yahoo". Reuters. March 9, 2007. Archived from the original on December 20, 2008. Retrieved July 3, 2017. ^ "Community websites take wiki path". BBC News. BBC. December 12, 2006. Archived from the original on March 11, 2008. Retrieved February 26, 2008. ^ "Wikia, Inc. is not the commercial counterpart to Wikipedia or the Wikimedia Foundation". Wikimedia Foundation. Archived from the original on November 25, 2011. Retrieved February 26, 2008. ^ "Wikimedia". Wikia, Inc. Archived from the original on November 8, 2017. Retrieved February 9, 2010. ^ Wikimedia Foundation 2006-2007 Audit Archived February 17, 2008, at the Wayback Machine page 9 says "The Organization shared hosting and bandwidth costs with Wikia, Inc., a for-profit company founded by the same founder as Wikimedia Foundation, Inc. Included in accounts receivable at June 30, 2007, is $6,000 due from Wikia, Inc. for these costs. The Organization received some donated office space from Wikia Inc. during the year ended June 30, 2006, valued at $6,000. No donation of the office space occurred in 2007. Through June 30, 2007, two members of the Organization's board of directors also serve as employees, officers, or directors of Wikia, Inc."
^ "A note on the Wikipedia Usability Initiative". Blog.wikimedia.org. January 21, 2009. Archived from the original on September 6, 2009. Retrieved July 17, 2009. ^ "Foundation-l: Wikia leasing office space to WMF". Lists.wikimedia.org. January 23, 2009. Archived from the original on June 21, 2014. Retrieved July 17, 2009. ^ "San Mateo-Based Wikia Lands Investment from Amazon.com". Silicon Valley Wire. December 6, 2006. Archived from the original on September 27, 2007. Retrieved March 8, 2007. ; California Business Portal, Agent for service of process address Archived July 23, 2012, at the Wayback Machine; Go Daddy, Registered domain address[permanent dead link]. ^ Lashinksy, Adam; Scott, Jagon (August 30, 2006). "For-profit wiki". Marketplace. Archived from the original on August 7, 2008. Retrieved June 19, 2009. ^ "Community Central:Advertising on Wikia". Community Central. Wikia, Inc. January 8, 2008. Archived from the original on May 22, 2018. Retrieved February 9, 2010. ^ "About". Fandom. Wikia, Inc. Archived from the original on May 21, 2018. Retrieved May 21, 2018. This page was last edited on 17 April 2019, at 03:38 (UTC).